Laser Toner For Less Than Mega Office Supply Stores! We sell Hi-End compatible, re-manufactured, OEM alternative, toner cartridges. Our cartridges are designed for critical applications where dependability is of the most importance. For a limited time all orders include free shipping and handling! Laser Printer Repair in Ventura, Oxnard, Camarillo, T.O. – all of Ventura County! 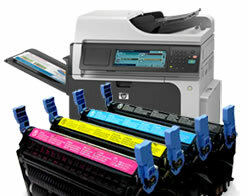 We also offer Flat Rate Printer repair, specializing in monochrome, color, multifunction, etc. Before starting we evaluate your printer, recommend any necessary parts, inspect, clean and test. Our goal is to keep your down time to a minimum; Remember “Your problem is our problem”. You can place a service call right from our Website!